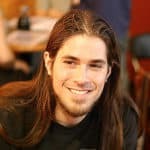 What’s the Best Counter Pressure Bottle Filler? Bottling beer can be a tedious process. 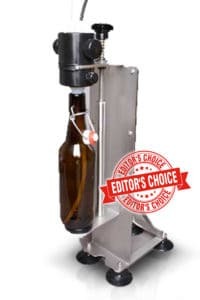 It can be a pain trying to manage foam, carbonation, temperature, and beer levels using a traditional bottle filler. Thankfully, there are more advanced systems available for this process. Counter pressure bottle fillers are typically used in commercial brewing. The point of this type of filler is to maintain carbonation while transferring from a pressurized vessel, such as a keg, to a beer bottle. They can also assist in regulating temperature and foam during transfer. There are many different models that have been designed to serve the needs of small-scale brewers to some of the largest in the world. It is with these fillers that all of the bottled beer we enjoy are filled. 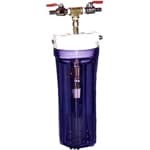 To use a counter pressure bottle filler, you will first need a pressurized keg filled with your favorite beer. Once you have this, attach the filler, active the release, and let it do the rest of the work. In this review, we’ll be focusing on some of the smaller scale systems. They are conceptually the same but are more practical for home and small-batch craft brewers. 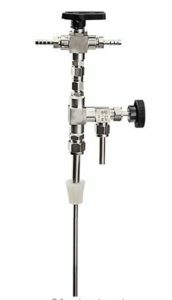 6 What is the Best Counter Pressure Bottle Filler? In my opinion, the WilliamsWarn is the best counter pressure filler for small batch brewers. It makes quick work of a 5-gallon keg and makes filling easy without any spills or loss of carbonation. It also provides a helpful how to use video. The height of this filler is adjustable to accommodate all lengths. However, it does limit beer bottle and growler diameter. The widest diameter it can fill is about 3.75 inches. This isn’t a big deal as most bottles aren’t that large. It just won’t be able to fill traditional growlers. You can be confident knowing that your bottles are going to be consistent and appropriately carbonated with this filler. The WilliamsWarn has been my go-to filler for the past three years, and I haven’t had to replace it, nor have I wanted to. You can see this bad boy in action down below. This is a very simple and straightforward counter pressure filler. 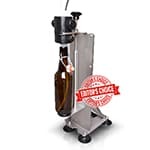 It provides you with the necessary tool to fill beer bottles or growlers from your keg. It is stainless steel which makes it more durable. Operation is easy. 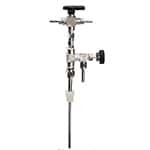 All you have to do is sanitize the equipment, adjust the bleed valve slightly, and close the tee. You shouldn’t have to worry much because it lives up to its purpose without hurting the budget. It includes 1/4″ tubing that can be connected from each side. Using the hose clamps on the top of the barb will also prevent leakage. 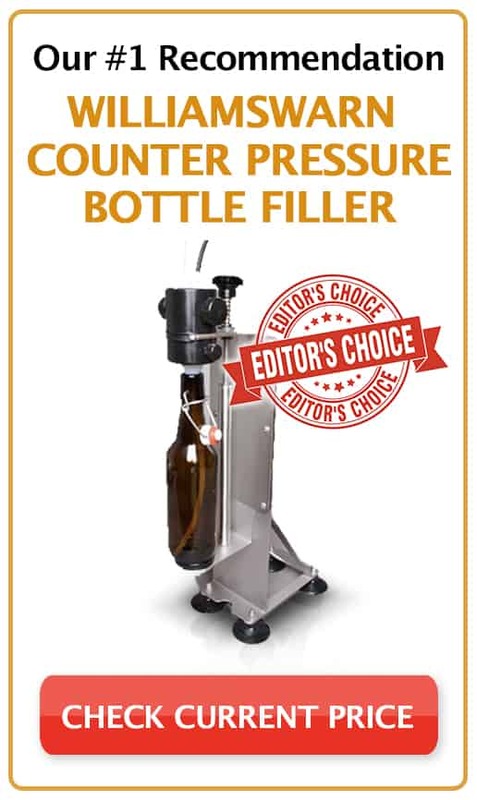 This counter pressure bottler is another great option for small batch brewers. Unlike traditional fillers, you can save a lot of time by bottling straight from the keg and eliminate the worries of oxidation and sediment transfer. Like most systems, CO2 is pushed into every beer bottle before each fill. This guarantees you won’t have any off flavors from trapped oxygen. The only problem with this filler is the bottle stopper. The stopper takes some adjusting to make sure you are getting a proper counter pressure. Although there are instructions that assist in the setup, it does take some calibration before you start getting good fills. Traditional bottle fillers are inexpensive and are usually used to transfer from primary fermentation to a bottle or growler. If you are going to transfer from secondary, they may be difficult to regulate CO2 pressure, fill level, and may result in foaming. On the other hand, counter pressure fillers are only meant to transfer from a keg to a bottle. They are very good at this, and I wouldn’t recommend another method. Depending on the bottle type and quantity, you may find that one will work better for you than another. What is the Best Counter Pressure Bottle Filler? For home and small-batch brewing, I recommend the WilliamsWarn Bottle Filler. The stand is very helpful as you’ll want to reduce the chances of knocking over your beer and it provides a good foundation for top end pressure. It also CO2 purges bottles before every fill. This is very important as too much oxidation can ruin your entire batch. Personally, I don’t care that it won’t fit a traditional growler because they are easy to fill from a faucet.